I placed a PDF (exported with InDesign) in a new document and used the editing function to change some text. Now I tried to export this document as an PDF-file with a publisher preset (PDF X3 etc). This causes an alert when exporting. The bug returns with version 1.7.0.174. But now its only possible to export PDF with the preset "PDF (for print)" - other presets does not work. 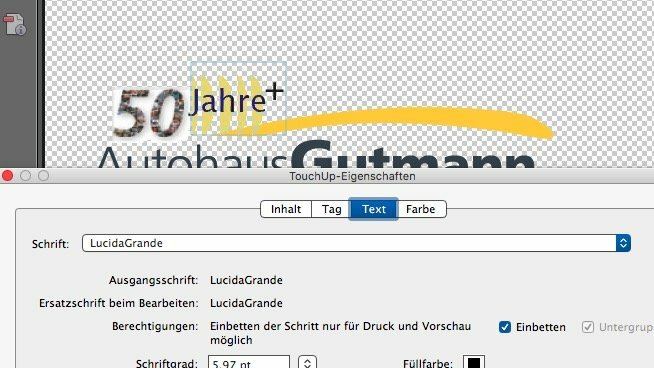 Can you achieve successful export as PDF/X when you convert the text(s) into curved before? Hi -I'm getting this problem too: An error occurred while exporting too. Same kind of thing as Kai2's description of events. I imported files from AD. Just to add: It didn't export from 'PDF (for web) (for print) or (for export) but it did just work for PDF (flatten). There is most likely something in the document themselves preventing the PDF export. Are you able to provide the documents at all? Hi Chris, I've attached the document here. attached a document. I suspect the logo is causing the error. But I don´t know why. Your file exported for me, using PDF (for export) PDF (for Web) and PDF (for Print) with no problems. That's interesting. these export-options work fine. But I use the export-options for PDF-X1, X3 etc. and options I created from these with crop-marks. Yes - none of those options worked for me either. I removed the logo and tried with (only) X4 and it did export. So the logo seems to be the problem. I can't say why that would be the case. @kai2, to me your document exports with PDF/X-4, -3 and -1a preset at 300 dpi without complaints. See attached. You might check these pdfs to look for any disturbance. (I can't judge what I see because of not knowing the original material). p.s. : What do you mean with "logo"? There are many elements forming such a thing, I can not recognize one or more of them as "logo" but just many text elements (most of them as curves) and 1 tiny foto "50". – Attach a file with "logo" only? On both your master pages is a text frame placed into a text frame which apparently is not meant to be seen/printed. Set them in the layers panel to invisible (on both master pages) and the file exports as PDF/X. Like a charm. p.s. : to avoid this in future it might help not use a text frame as color background shape. Rather use the rectangle tool or one of its shape family instead. p.p.s: the artistic text is not necessary for text, unless you want to deform text. You might remove its tool icon from the tool palette and replace it with the 'double' text tool to avoid misuse. p.p.p.s: your signature. huuu. It almost fills my screen. what for? Would you mind to calm it down, please? attached the logo-document and the alert by exporting a PDF/X-4-file. I tried to export your file as a PDF/X-4 file and it worked properly. There was a warning about the Frutiger font for the "Jahre+" text when I opened the file, but I substituted it to the version I had on my system. Maybe you could convert that text to curve before exporting (like you did with the lower text). I also think that AFP has a problem using the font, but I don't have a warning message when opening the PDF-file. It´s an Adobe-Postscript-Font - no problem to work with in InDesign. Maybe a problem with the pdf-import? @kai2, when I recently opened and exported your first document ( https://forum.affinity.serif.com/index.php?/topic/73780-pdf-export-alert-revisited/&amp;do=findComment&amp;comment=386319 ) I did neither get a warning message when opening the file nor when exporting it. So I was not aware about the ? in front of the font name in character pane. That made me now activate Frutiger after opening your test-logo.afpub (which opened without complaint) – and now I get the same error message when exporting as PDF/X. – So I agree to your supposition that the font here causes the export issue. I tried other weights than "56 Italic" (which you have used?) and they did export fine, e.g. "46 light italic" and "57 bold italic". It reminds me to a similar experience with the font Univers, where only particular weights could get exported as PDF/X and others resulted in an error message. I give up at this point. For now either the font file might cause the issue on export or it happens while PDF import or even the imported PDF could contain the failure-cause already. @thomaso Thanks for your test series. I have had the same experience - only certain font variants of the Frutiger create the problem. I hope the affinity team will work on it and find a solution.